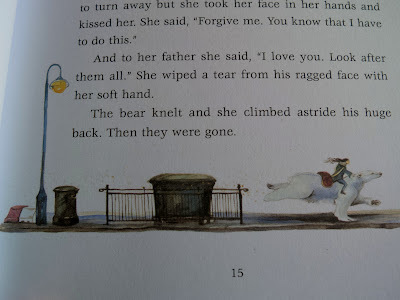 From the first moment she saw him, the girl knew the bear had come for her. How many times had she dreamt of him, of riding on his back, sleeping wrapped safe in his paws, walking beside him? How many times, on their terrifying journey, had she imagined the bear walking beside her, guarding her family while they slept? Now he was here, as if spelled from her dreams. You may have heard me say before that “East of the Sun and West of the Moon” is my favourite fairy tale. The reasons why range from my not so secret love of stories set in snowy Northern landscapes and featuring talking polar bears to its memorable protagonist, a determined girl who seeks, finds, and rescues her prince. 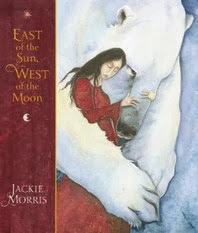 So imagine my excitement when I spotted a new retelling by author and illustrator Jackie Morris on this year’s Carnegie Medal nominations list (sadly the book didn’t make it as far as the longlist, which was announced earlier this week). I knew I’d have to get my hands on it as soon as I possibly could. 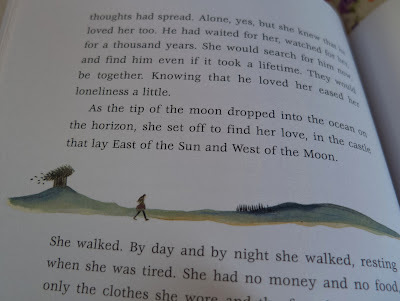 However, I have to be very careful when I approach retellings of “East of the Sun and West of the Moon”: I have this very concrete idea of what I’d like one of them to do in my mind, and it can be really easy to slip into the trap of resenting a perfectly good book for not being your Dream Book. Let me tell you a little bit about what my Dream Book does: it approaches the nighttime encounters between the protagonist and the cursed prince as an opportunity to explore unspoken desires and the reasons why they remain unspoken; it addresses trust and consent; it looks at the enormous vulnerability of sexual intimacy; and it conveys that feeling of wanting to know more, more, more about someone but having to balance that longing with the knowledge that trust will come at its own pace and in its own time. These are some of the themes and feelings I project onto the empty canvas of this fairy tale I love so much. The retellings I’ve found so far never quite hit the mark, but that’s the magic of individual readings — the thematic resonances of a story won’t ever be quite the same for two readers. 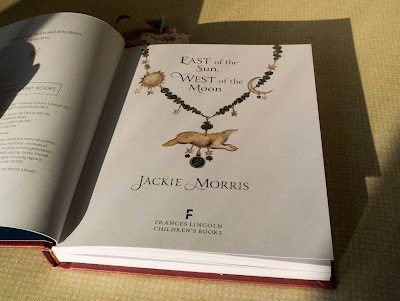 Let’s begin by getting this out of the way, then: unsurprisingly, Jackie Morris’ East of the Sun, West of the Moon did not turn out to be my Dream Book. This isn’t to say, however, that it isn’t a very good book. As I said above, I’m always excited to find new versions of this story, even if my ideal one remains unwritten (or at the very least undiscovered by me). Additionally, this is a fairy tale that particularly lends itself to feminist retellings, with its emphasis on female desire and agency and its heroine who gets to act on what she wants and set the terms of her own story; Morris’ beautiful version makes the most of these elements. They had come for him one night. A knock on the door — then they burst into the house and dragged him away. Days later they brought him back, broken and bruised with threats of what would happen to his wife, to his children, if he continued to write. So they had fled, a frightening journey over land and sea, to claim asylum in this new country. Yet things were little better here. They were treated as criminals ‘while their case was investigated’. Over and over, her father was interrogated about his torture at the hands of the government, was forced to relive the horror and humiliation until he sand into despair. Unable to work, feed or clothe the family, they lived off charity, little more than beggars. I loved this — I loved how, from the very beginning, Morris establishes the heroine’s background and makes it clear that this is a fairy tale about a girl who belongs to a group of people whose stories we don’t often get to hear. And yet that doesn’t mean that the struggles that brought her here, to the moment when the “once upon a time” begins, are going to be the only thing this tale is about. The promise that the papers will come and the girl’s family will be safe is part of what the white bear has to offer, yet we know that there’s more to why she’s following him than concern for her family. There’s an element of pure raw longing to her decision — this is a girl who wants to travel through snow-covered forests on a white bear’s back, who wants to see what lies beyond the boundaries of her world, who needs to leave even as the leaving breaks her heart. 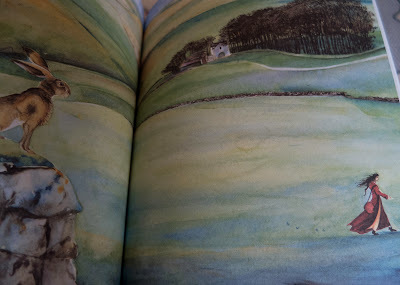 Perhaps because I’m older, or perhaps because Morris’ retelling brings it to the forefront, I found myself more drawn to this aspect of the fairly tale now than I had been in previous readings. 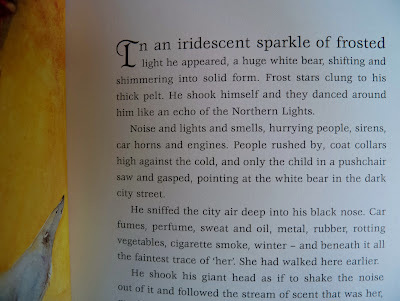 This story about a girl who follows a white bear because she wants to see the world, and then later follows a cursed prince to a place that lies east of the sun and west of the moon, is also a story about leaving and homesickness and tough choices that are nonetheless right for your life. But of course, your mileage may vary. The line that divides ornate writing from purple prose is different for each reader, and there’s no absolute standard defining what succeeds and what fails. And even for me, these moments were few and far between — overall the tone of the story was just right. There are a lot of tragic love stories where fate and other people get in the way of romance. There are a lot of books where it turns out that a first romantic partner wasn’t so perfect and the hero or heroine flies into the arms of someone less awful. There aren’t very many stories where love goes wrong due to general human issues and the protagonist moves on to a new relationship, but is still able to say they loved that first person even if they would never go back to them. Just for once, could we have a grown up conversation about girls in love? Could creators stop using “he was evil all along” as a way to resolve a dramatic love triangle? There’s no need to justify the fact that girls fall in and out of love, and got and do it all again with someone new. Often the first guy is just a regular guy who no longer floats that girl’s boat. It would be nice if we could see that reflected in media because it happens. A LOT. Friends, I’m absolutely delighted to report that I’ve found one such story. I have to say had some reservations about Berneen’s new love interest (alluring yet dangerous male romantic leads are such a can of worms), but my joy at having found a story where a girl is allowed to leave a partner for someone else with no shaming or reproach won the day. While I've never read this particular re-telling, I always find it unnerving to pick up a re-telling of a favorite. All of those expectations just sort of loom over my head as I start reading. I loooove these illustrations. 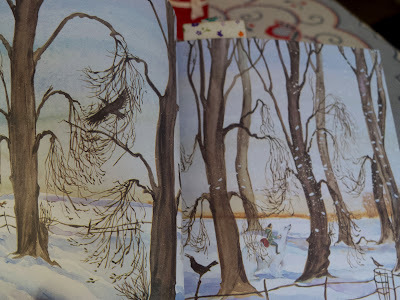 Are there a lot of illustrations of her traveling, or are those just the ones you excerpted? Because I really REALLY like the illustrations of her traveling, and part of me wants to buy the book, cut it up, and frame illustrations of her walking all over my apartment -- like, one going up the stairs, and one going from the living room to the dining room, and like that. Oh this does look beautiful, and interesting. This is one of my favourite fairy tales too, although I have always felt a tiny bit disappointed that the bear turned into a boring old man. I enjoyed your review very much, thank you Ana. This looks like a lovely book -- and this fairy tale is one of my favourites as well. I've enjoyed many versions of it, and I do like the elements you've pulled out, that it is about a girl with agency. That, and the northern setting, are likely the reasons I love it so much. Jill: Aw, that's too bad! Fingers crossed that your library gets it eventually! Kelly: Remember when we read East together? That was a lot of fun. Jenny: There are a lot of those! And I loved how they conveyed this sense of longing for seeing the world that goes so well together with the themes of the story. The Six Swans is a wonderful story too. I'd love to read more retellings of that. Helen: Thank you for that link! Her blog is indeed lovely and I hadn't visited it before. Melwyk: Yes, the setting is so great. Definitely read this version if you manage to find it! My library has this, so I have requested it. I am very curious to see if I will like it. It's not a fairy tale I am completely familiar with, so it will be interesting to see how I react to how it is told compared to you, who loves this fairy tale. I have to say one of my favourites is The Snow Queen, and that one I am rather particular in how it's told!